Now don’t mistake bathroom window curtains for shower curtains! This article covers window treatments for your bathroom windows. I’ll cover shower curtains in another article. 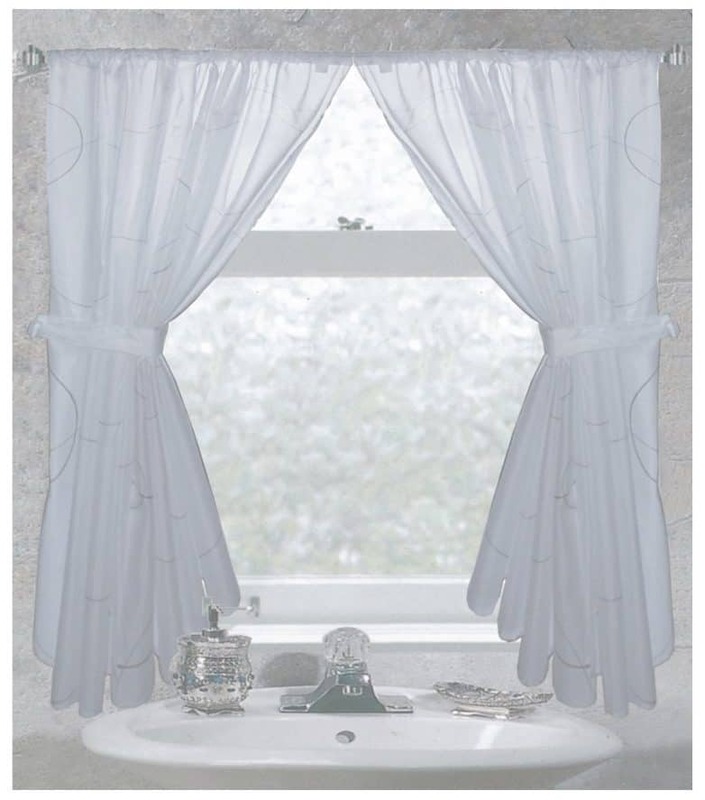 Bathroom window curtains create a visually aesthetic appeal in your bathroom without the need to spend a lot of money. 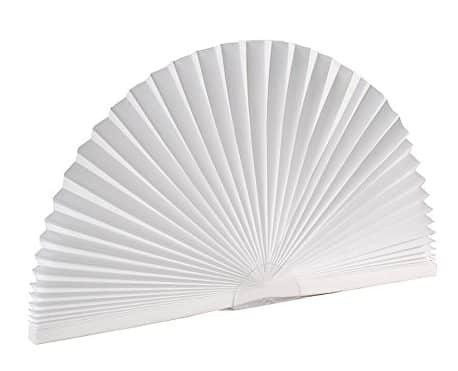 They also give you privacy without blocking all the light. 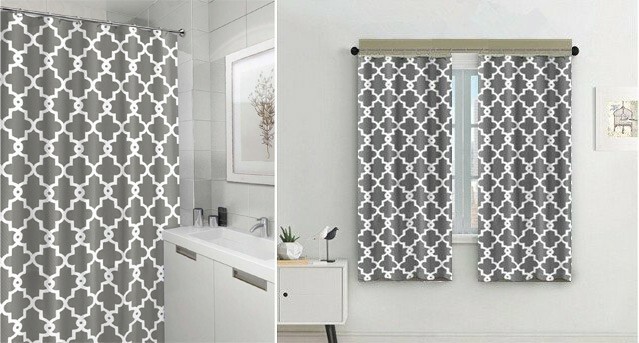 A lot of bathroom window curtains I’ve seen in client homes can be small or the wrong size, preventing any privacy you would expect to have in your bathroom. 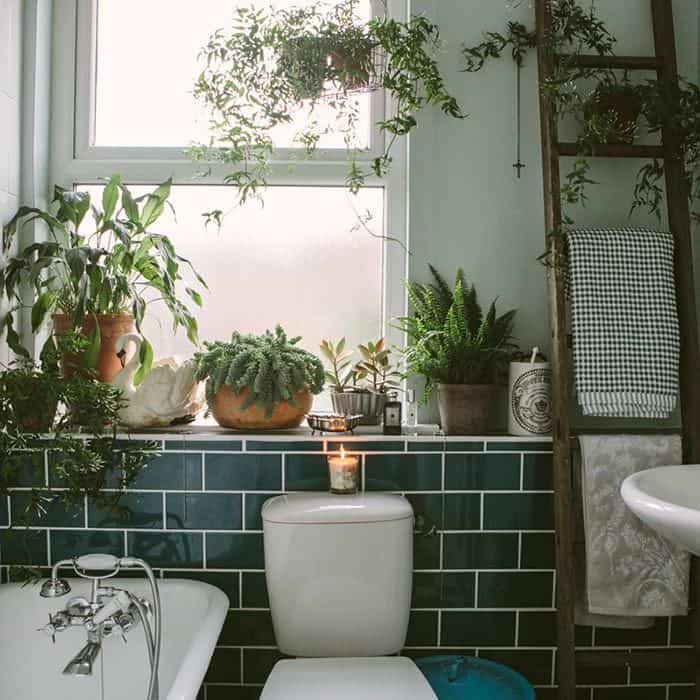 But I’m here to assure you that no matter the size or shape, there is always an option out there that fits your bathroom window exactly how it should. You want natural light to come into your bathroom, but you still want to maintain privacy, so this is why you need bathroom window curtains. They are different from the curtains you have on your living room windows or the curtain panels you have on your bedroom windows. Bathroom curtains are meant to provide privacy, be durable to withstand moisture and humidity, and create an atmosphere for relaxing. 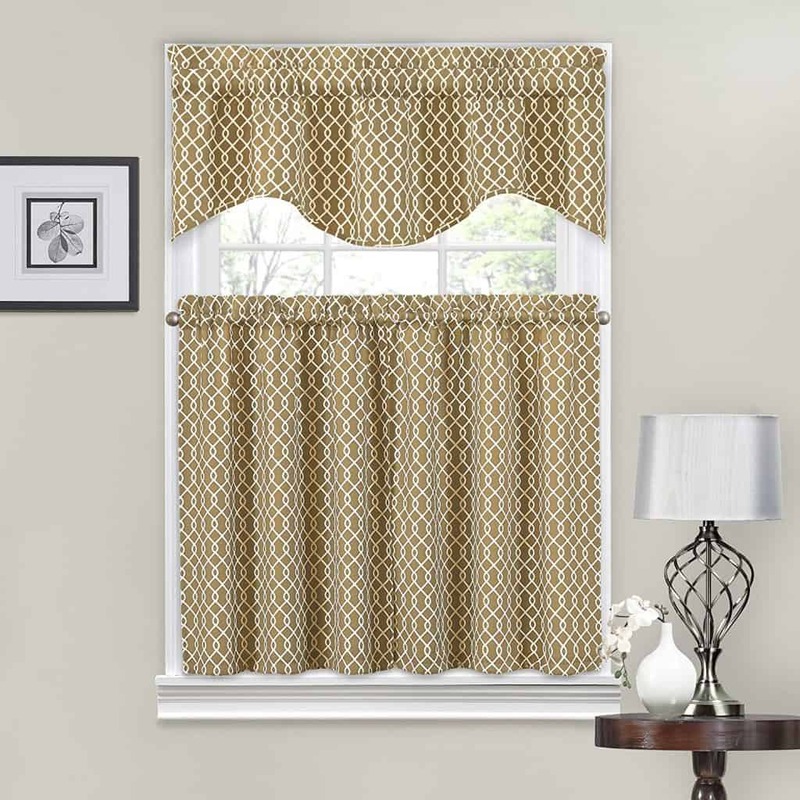 There are different kinds of curtains that will go perfectly with most bathrooms. So let’s consider the best materials for your bathroom window treatments. Sheer bathroom curtains let in light while still offering you some privacy. Vinyl curtains are convenient for bathrooms because they can get wet and then dry easily without worrying about mold or rot. They are inexpensive, simple to install, and easy to clean and maintain. They come in different colors and designs. 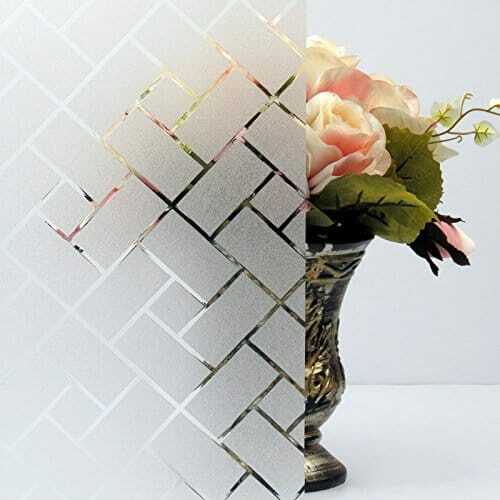 So, you will surely be able to find a design that will suit your taste and bathroom decor. You will easily find one that coordinates with your shower curtain and it can be made out of the same material. 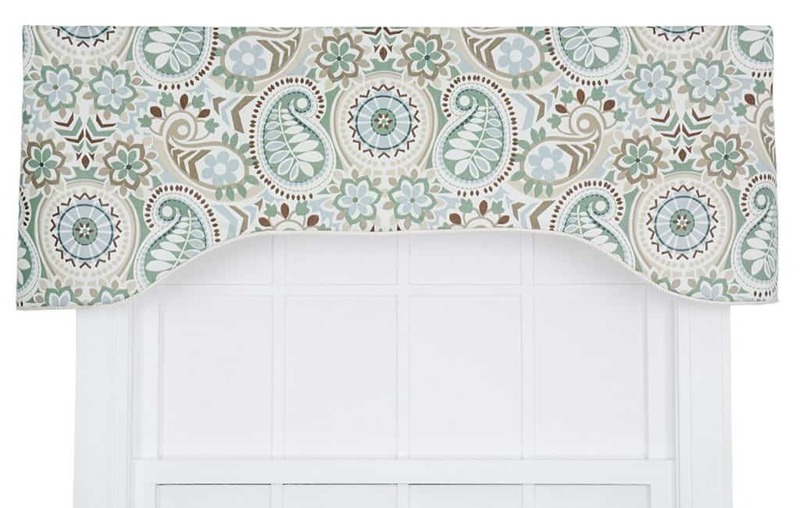 What about Small Bathroom Window Curtains? If your bathroom windows are small, there are many creative ways to keep them looking stylish while still getting the privacy you’re looking for. Consider curtains that are made especially for the window. 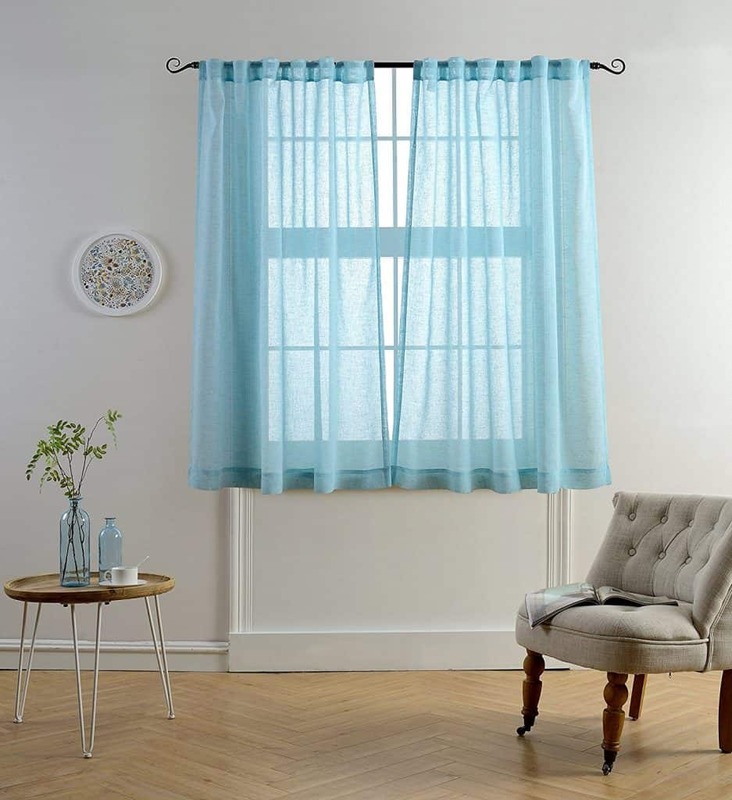 Have the curtains hemmed to fit your window perfectly so they have a nice clean look to them. You can also sew a tie-back to each one, then you can pull them up and out of the way when you want to let some light in. A fun idea for decorating a small bathroom window is applying a shutter to it. A shutter will give your bathroom a homey feel, while still allowing you to have the privacy you want. 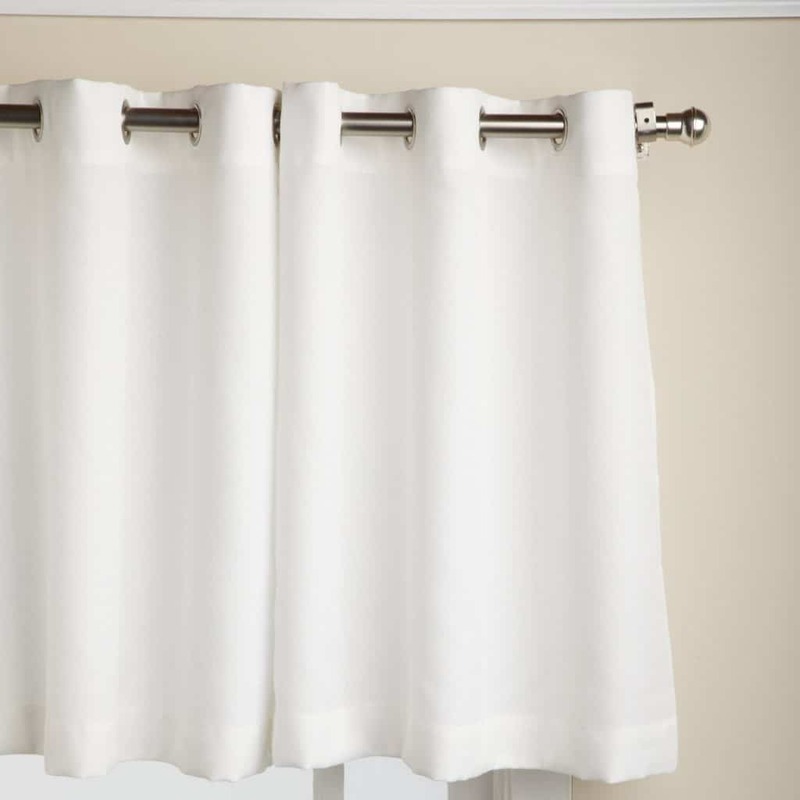 Another option would be using panel curtains. 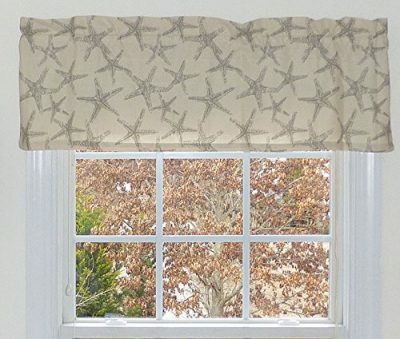 Panel curtains are easy and simple because they come in many different prints, designs, textures, and colors. They are easy to match with any decor. Some bathrooms have windows that are much larger, but some of the small curtain ideas may work just as well with larger windows. 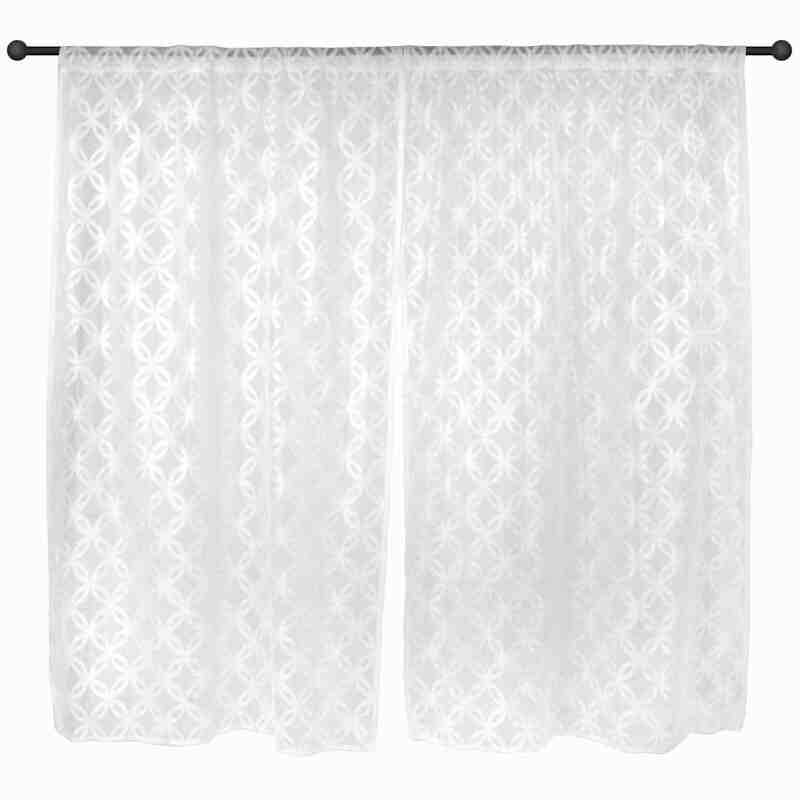 For example, classic hanging curtains and panel curtains both look great with large bathroom windows. They provide an adequate amount of privacy while still looking nice. 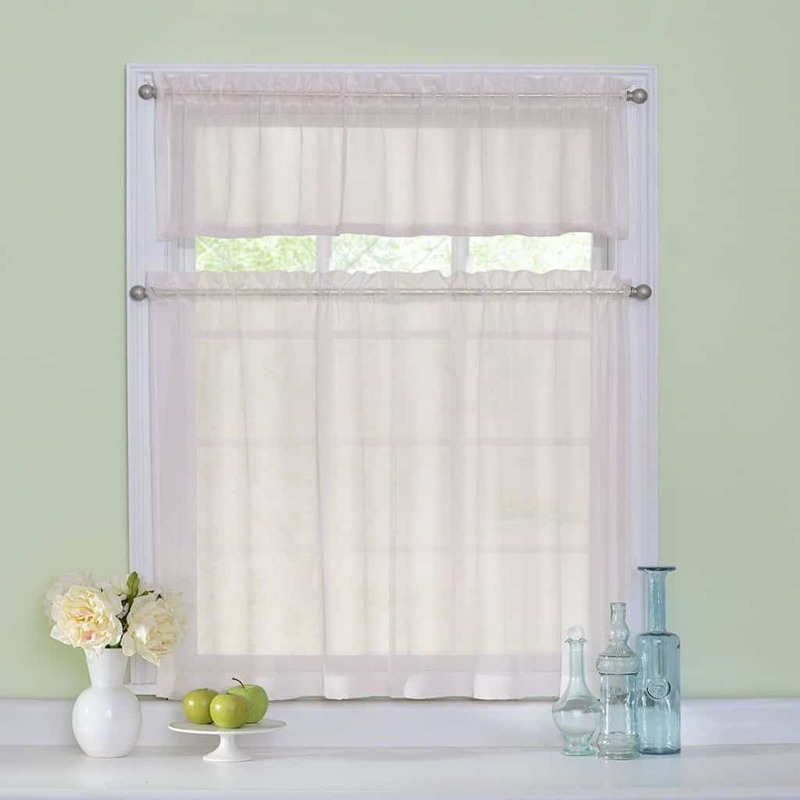 With larger windows, you should also consider a curtain and blind combo. 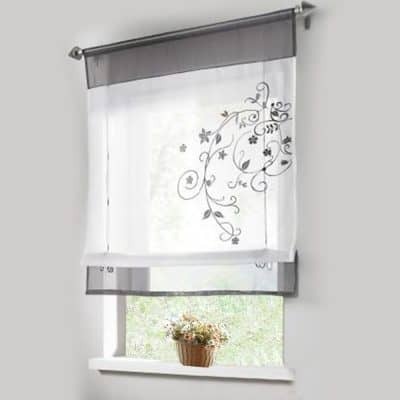 Having blinds will ensure privacy while still incorporating decorative curtains as a style element. Not all windows are rectangular. If you have arched windows, you still have many curtain styles to choose from. 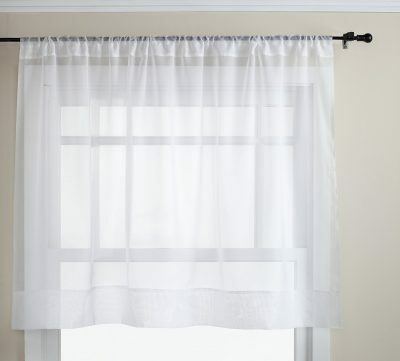 You can hang bathroom window curtains directly under the arch of the window leaving the arch open, allowing light into the room, but giving you privacy at the same time. If you do not want to leave the arch uncovered, consider draping curtains over the arch giving the window an elegant style. There are also arch-shaped bathroom curtains made specifically for this purpose! 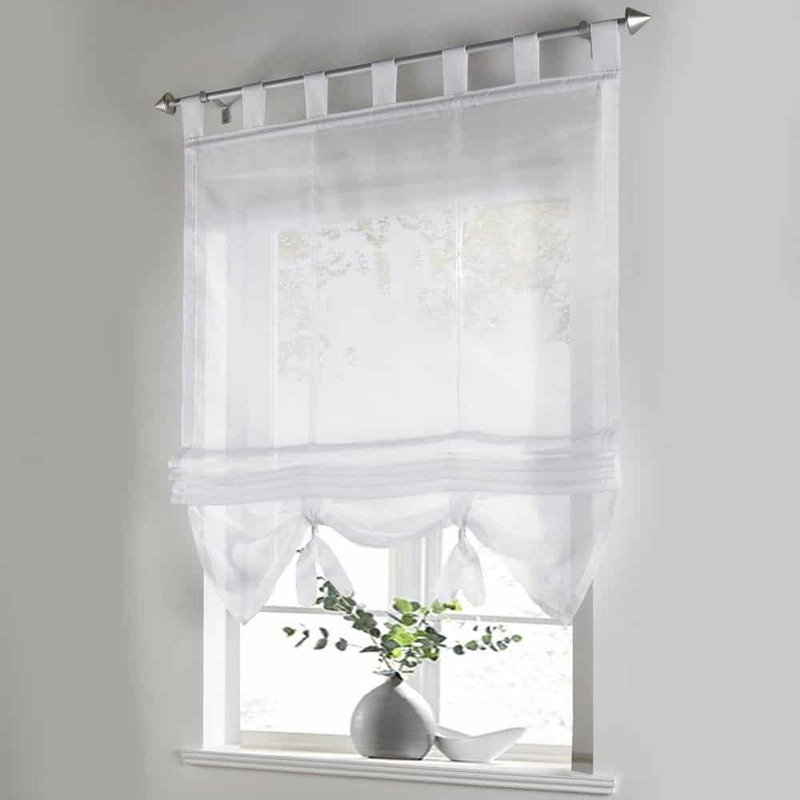 If you have rows of windows in your bathroom, hanging curtains are always a great choice. 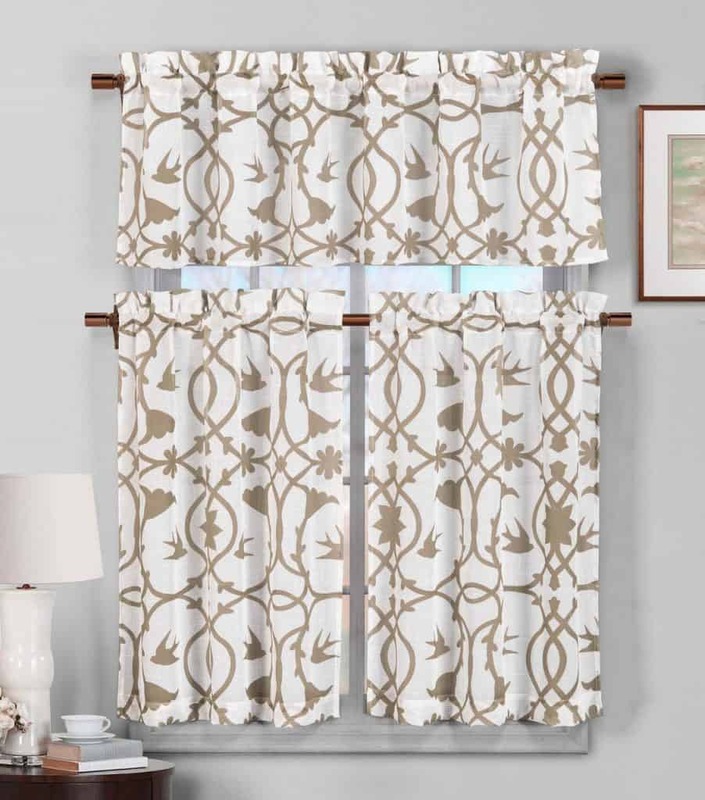 You can hang matching curtains on each window, giving the windows a uniform look. If you are looking for something a little different, you can create a frame with your curtains. For example, on the two outside windows, hang one long curtain. 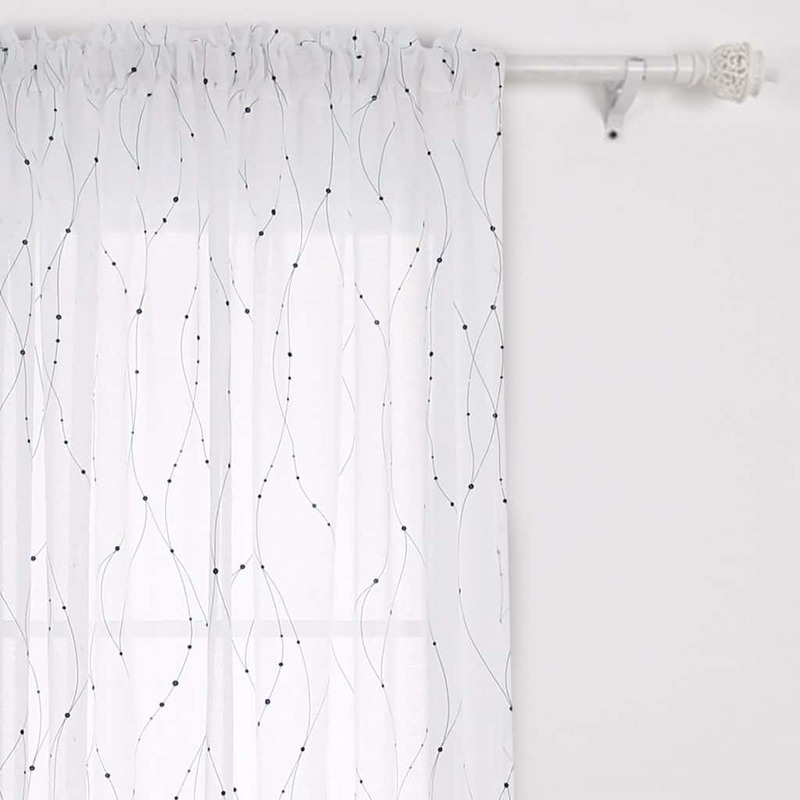 On the middle windows, hang short decorative curtains. 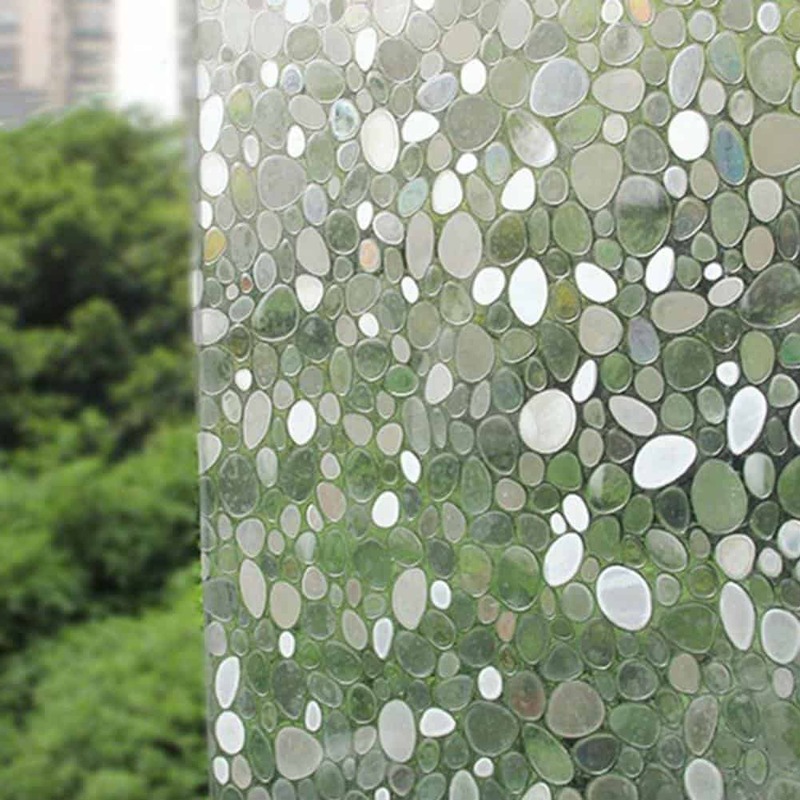 This will give your bathroom windows a unique and stylish look, which is very easy to achieve. 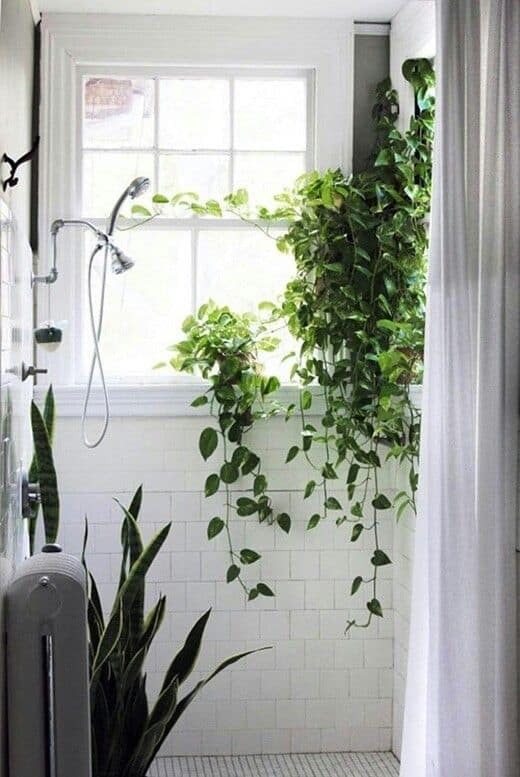 A great alternative idea to bathroom window curtains is to use natural items such as shrubs or plants that will block your windows. This is a perfect solution for large towering windows. Just put large plants in convenient planters and place these near your windows to cover them. 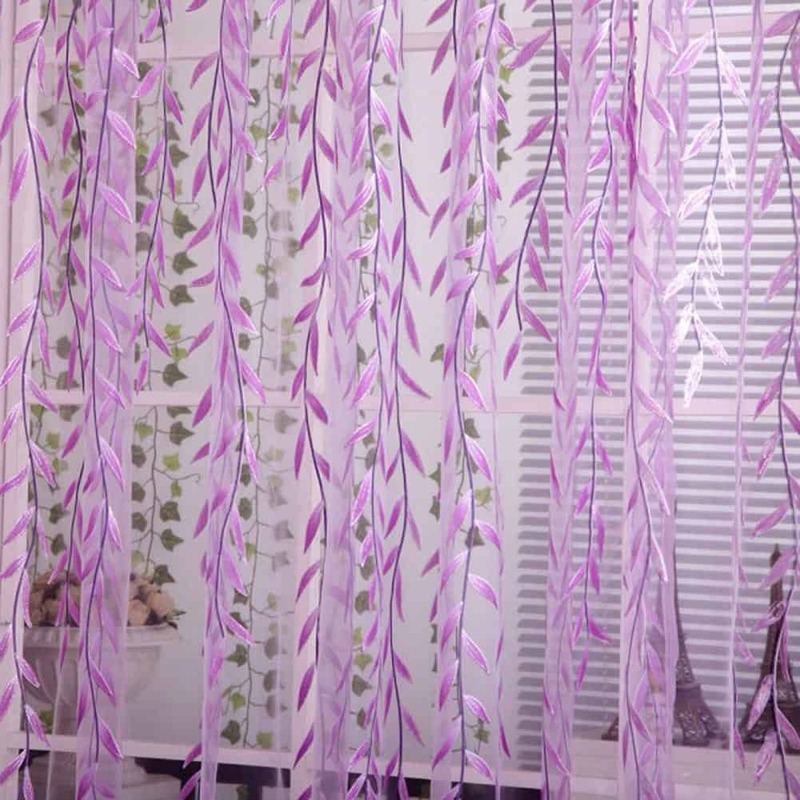 You can also use vines to create a curtain! Really? Yes, vines can hang from the top part of your window and cascade below. It gives you a cool jungle looking bathroom effect. A bright and fun (Bohemian) window curtain idea is a one made of different colored beads or shells. 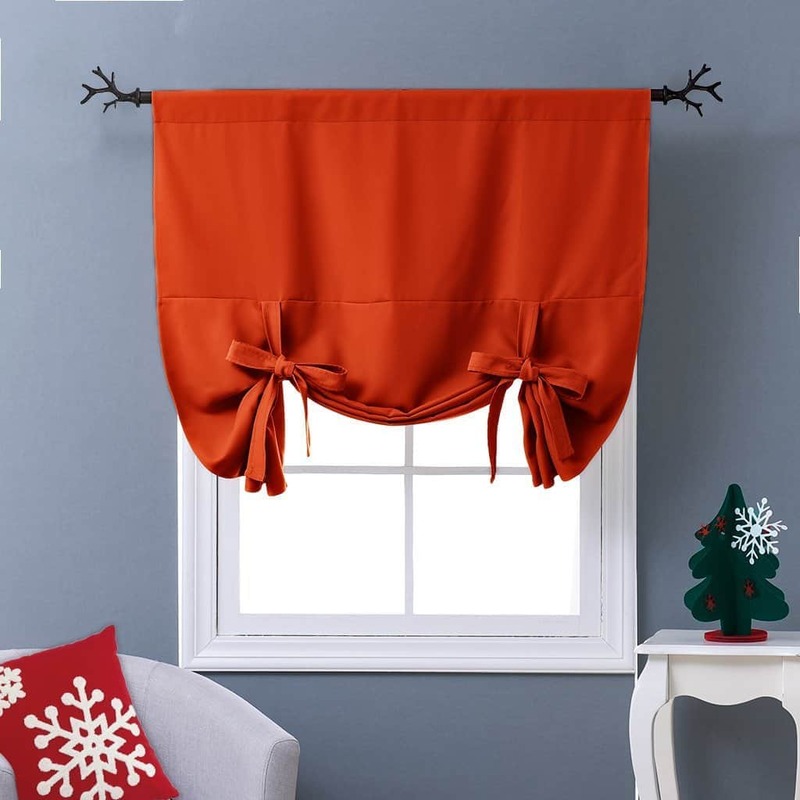 Simply string them together and install them over your windows. Let the beads cascade downward and provide you some privacy. 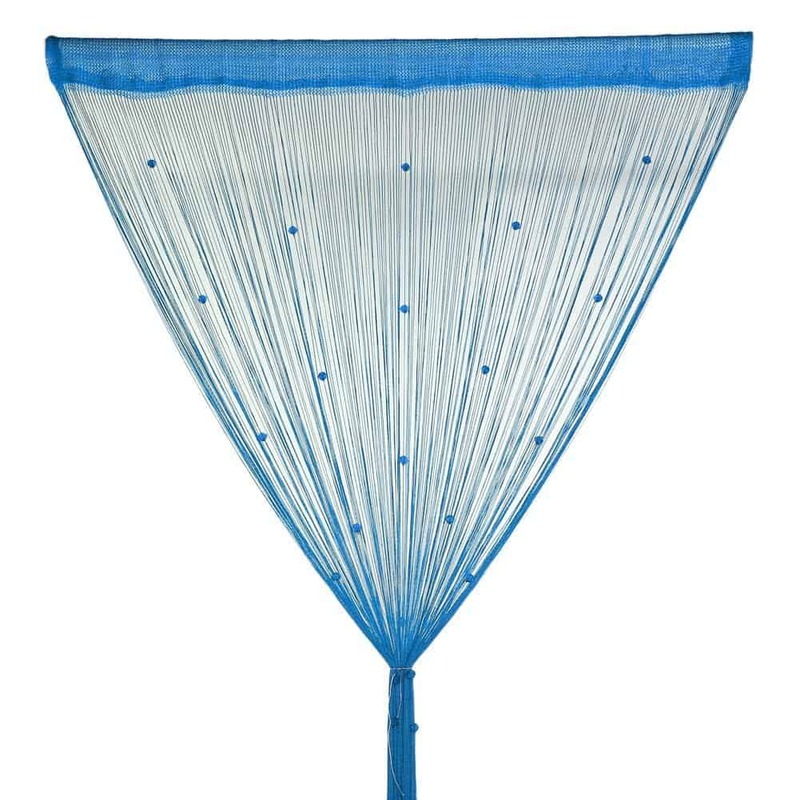 Strings of beads may also be parted to the side to open the window and allow natural light to come in and is easy to clean at the same time. If you don’t want to hang anything, you can add these great translucent “stickers” to your windows. They let in the light and obscure the view of peeping toms! Bathroom windows are special because no two bathrooms are the same. This gives you tons of freedom in your decision making. 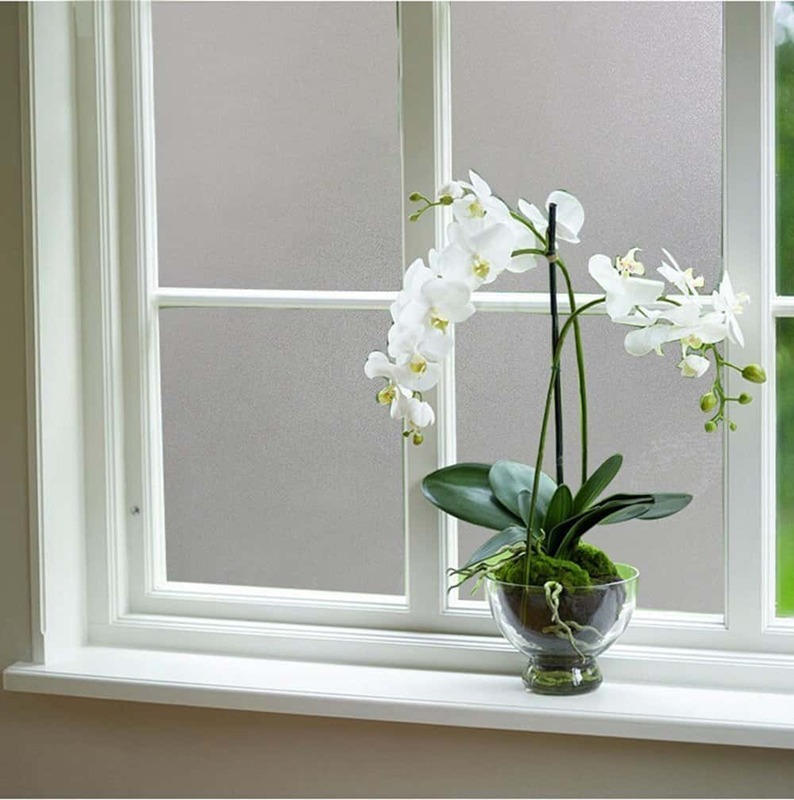 Bathroom windows come in all shapes and sizes and so do bathroom window curtains. 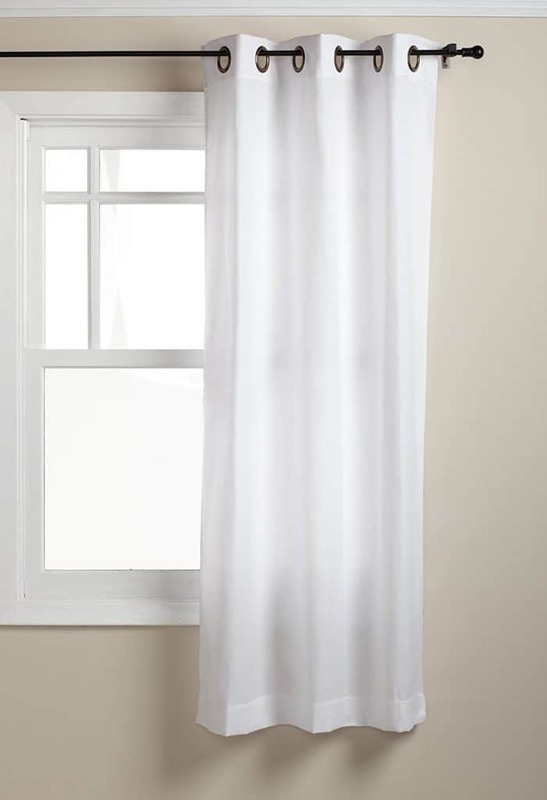 There is a bathroom curtain that is right for you, no matter the location or size of your bathroom window. A bathroom can be a messy place with all the soap, hairspray, and water that is being used inside it every day. 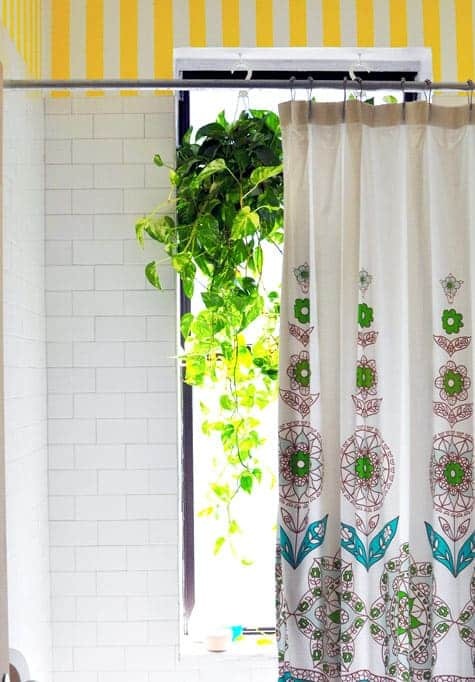 Use the right kind of bathroom window curtains so that you will create a look that is not too boring and not too sloppy either. 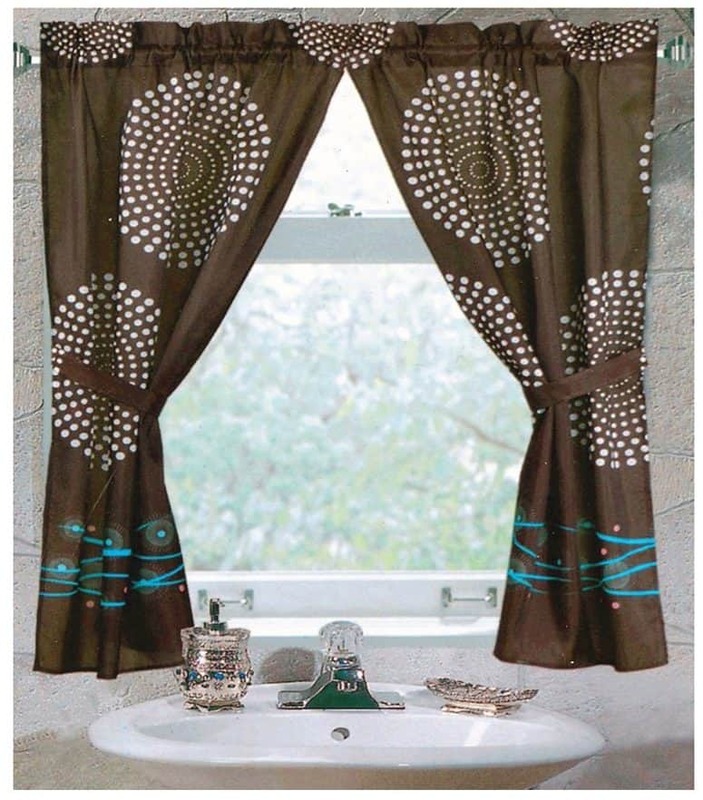 You do not have to spend a lot of money to update your old bathroom window curtains. All you need are a few ideas, time and easy to find materials and you will have new bathroom windows in no time at all! Another great collection of bathroom window curtains. These are great additional to my bathroom library ideas. These for the post. I like that you recommend having curtains that are not boring and not too sloppy. I can see why this would help add to the ambiance. You might also take a couple different options to see which style of curtains looks the best in the bathroom. I have got amazing ideas by reading your this article. I am astonished by reading it. It is mind blowing. I can’t describe it’s quality by some words. Thanks for sharing this with us and keep it continue. We don’t wanna deprive from you more tips.